Description: This tulip represents the essence of elegance: Creamy ivory buds open to exquisite pristine white blooms that seem to glisten in the mid-spring garden. Sturdy 16-18” stems are perfect for arranging, and the color complements other spring flowers in long-lasting mixed bouquets. Plant along walkways, or as an accent drift in the perennial border – it also serves as a beautiful divider between competing colors. Plant in containers to decorate porches and decks, or try forcing them to hurry spring along. 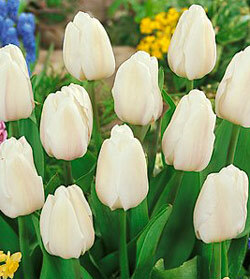 Order today – our premium tulip bulbs are delivered for fall planting. Bloom Time	Early Spring Color	White Foliage Color	Green Height	12-24" Sun Requirements	Full Sun Type/Size	11-12 cm Bulbs Hardiness Zone	3, 4, 5, 6, 7, 8 Each order is for a qty of 5 bulbs.